Later topic: safety of california wash during pregnancy? Putting a press on wheels? I want to put my C&P 10x15 on wheels… or something. Something low-profile as to not add much height, but will allow me to easily move the press when I need to. Also, be careful, the C&P looks top heavy and with the extra weight of the flywheel on one side, it might be an accident waiting to happen. If it fell over, it could badly hurt you! Probably usable. I see though that it looks like all the weight of the press is out on the foot tab. I would like to see support under the leg before i would use them. if you happen to roll it over a slight obstacle, the shock may do damage you don’t want. Hard pass on that design. The press was not designed to be lifted like that. One crack in the floor you could torque a wheel over and snap the frame at the bolt. We have a 12x18 we move around all the time for events, it’s mounted on a permanent skid we can lift with a pallet jack. To solve the hight issue we have a small portable deck, that wraps around the press to give the operator a boost. If you still really want the wheels, I would cut a few pieces of steel flat bar to run between each wheel to strengthen the base of the press, it would give you an added place to put a shelf as well. Put it on a strong wooden pallet, and move it with a pallet jack. Wheels will only make it less stable, and the size of the wheels needed would be ungainly. I am going with Bill on the pallet jack. Northern Freight has em cheap. I love mine. Built a custom pallet so to have a solid top. Any major downside to using two regular 1,000 lb furniture dollies, one under each rail? Assuming I can lock the wheels or keep it from rolling anywhere. Also, preferred method for getting the press up onto a pallet? 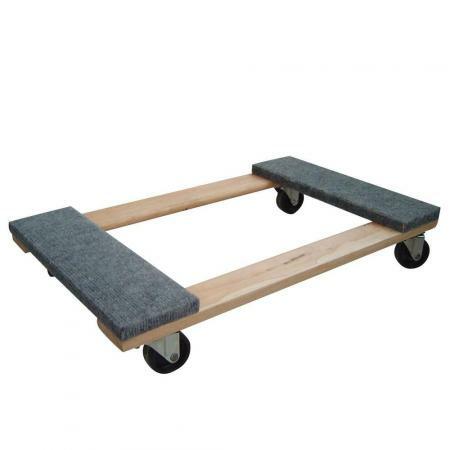 Furniture dollies are designed for a weight that is spread out over the entire surface. By concentrating the weight as you would with a press, the chances of them breaking would be high. Personally, I don’t want to operate any press that is not firmly sitting on the floor. Any wheel that is not steel will always have a flat side on the bottom and is a real issue to push. You want steel wheels and large diameters. I’m still sticking to the pallet jack. It was recommended to me by someone who has been moving these about his shop for years. Make a custom pallet with little or no spacing on the deck. Make it so it extends out under the operators position so that you can stand on it and operate the press. I don’t recall the name of it but heavy machinery movers use a low-profile “link-belt”-style roller unit with a swivel platform for the load to sit on, so the rolling part can be steered to change movement direction. They are shorter in height than casters and many times stronger, as well as spreading the weight over a larger area of floor. They ain’t cheap, but they are perhaps the ideal solution for mobile presses, especially if you use a sheet of vibration-absorbing rubber/plastic between the press and the carrier. We used to use them under a very large sheet metal brake that weighed as much as a 10x15 C&P. Maybe you’re referring to machine skates or machine rollers? I’m with Gachap on this one. I don’t think I’d operate a C&P press that is not firmly planted on the floor. One inadvertent lurch while operating could result in the loss of your fingers. I’d also be leery of the little feet wheels being discussed since they will put side loads onto the press frame if it encounters an irregularity while being rolled. I’ve seen far too many presses tumped over while being moved to think these little wheels are a good idea. Just my view on things, platens were not intended to be moved around, being made of cast iron they are fragile! Just in passing, I once saw at a printing trade exhibition, on the Heidelberg Company stand one of their platens mounted on large springs, it wobbled about a good deal but maintained perfect register whilst running! DRUPA I think it was, in the 1960s. No wheels under a thousand-pound press - EVER! Wheels introduce a myriad of problems - complications and serious risks. I move a lot of presses - around my shop and into and out of my shop and others. I always use pipes instead. Two 3’ x 1.5” sections of black steel pipe cost about $6 each - cut to size at Lowes or Home Depot. All of my C&Ps are always mounted on 2x4 or 2x6 rails running front to back under the press. A good base for any purpose, and easy to install as well. So, instead of risking so much by putting your press on wheels, use some 1.5” pipes and a small jack or crowbar to lift the press up onto a pipe when every you want to move it. I’m 68 years old and still move my Heidelberg Windmill this way - and, of course, all of the smaller presses. (C&Ps) It takes only a minute to get the first pipe under the front of an 8x12 and another minute to get it under center and add the second. For straight forward motion, push the press until it passes the center balance point, pause for a moment, tilt the press back, lay the other pipe in front, push forward and continue. It really only takes a few minutes to move a press across the room this way if need be, and removing the last pipe is just a matter of using a crow bar or small jack to raise it up 1/4” to get the pipe out. see: http://excelsiorpress.org/reference_html/movingapresssafely.html for a more detailed discussion of this technique. I recently taught this technique to some folks from a museum and they were amazed at the ease and simplicity of this process. Believe me, after 50 years of printing and moving C&Ps, this is the *best* way I have found of moving pretty much any press anywhere I want it to go - even up onto a trailer. All you need are two pipes, a crowbar or small jack and a smooth surface to roll on. And, if you don’t have a smooth surface (like going across a lawn or gravel, etc. ), just lay down 2 - 2x6 “rails” - or even a sheet of plywood - to make a smooth surface. Although I will occasionally use a pallet jack for short, straight moves, or going through a hallway, etc… I prefer the pipes for nearly all the moves I am involved in.. Try the pipe technique - inexpensive, safe and easy as pie! By using casters that swivel, in the worst case, you are shortening the ‘wheel base’ dangerously close to the centre of gravity, once these two points meet, or there is a bump, the press falls over. If it was required to move the press, the above mentioned pallet and pallet jack is an excellent idea. Make sure the pallet is quite large, I believe 45” x 48” is a standard size and the press is centred on the pallet. Make sure it is a good one (some pallets are one-way use) and pre-test to see if your pallet jack fits it and can jack it up. This sounds redundant however some wood pallets are designed for fork trucks only. Great idea if you never plan to use this press to do any printing. The rocketing of the press as it prints will cause the press to move around the room. This is adding another movement to the press while it’s printing. And, as many have stated, it will failover! A tedious but effective way to elevate a piece of heavy equipment is to use several blocks of 2x_’s. (2x6’s or 2 x 8’s) Using a jack or Johnson bar, tilt one side just enough to get 2x’s under the uplifted side, but not so much that it will fall. Once set, tilt in the opposite direction to place 2x’s under the other side of the object. Using the jack, repeat this process until you get to the height needed. You’ll want to have enough properly-sized 2x’s before you start. You can get a press or other onto a pallet this way, or set it on 2 x 4 rails as Alan suggested. Best done with 2 people. Do you think I posted that enough times!